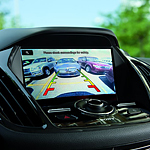 Ford's New Suite of Driver-Assist Technologies: Co-Pilot360 | Cortese Ford Lincoln Inc.
We here at Cortese Ford are extra excited about Ford Co-Pilot360, Ford's suite of cutting edge driver-assist technologies. The technologies help drivers perform vigilantly and safely on congested roads and in the face of increasing amounts of on-road distractions. Here are two technologies we want to share with you. Blind Spot Information System (BLIS) uses a radar to monitor your blind spot, flashing a light in your side-view mirror when vehicles enter your blind spot on the road. This helps you merge and change lanes with better timing. BLIS also detects cars and pedestrians who cross behind you as you back out of parking spaces. Automatic Emergency Braking (AEB) and pre-collision assist with pedestrian detection improves your safety. The system detects cars and pedestrians who cross in front of you as you advance, alerting you with warning flashes and sounds. If you fail to stop advancing after the warning flashes and sounds transpire, AEB deploys to prevent a collision. Ford Co-Pilot360 is scheduled to be standard on 90 percent of new Ford models by end of 2019.